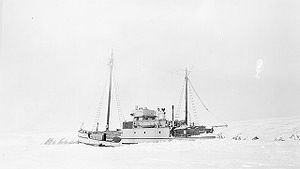 St. Roch wintering in the Beaufort Sea, 1948. RCMPV St. Roch is a Royal Canadian Mounted Police schooner, the first ship to completely circumnavigate North America, and the second vessel to transit the Northwest Passage. She was the first ship to complete the Northwest Passage in the direction west to east (Pacific to the Atlantic Ocean), going the same route that Amundsen on the sailing vessel Gjøa went east to west, 38 years earlier. The ship was most often captained by Henry Larsen. Liverpool born Sgt. Fred S. Farrar R.C.M.P. (1901-1954) was a crew member of St. Roch for various voyages including the 1950 voyage that circumnavigated North America, he wrote the book Arctic Assignment: The Story of the St. Roch. which was published posthumously in 1955. The Stan Rogers song "Take It From Day To Day" is the lament of a crew member on St. Roch. The ship is located at the Vancouver Maritime Museum in Vancouver, British Columbia, Canada, and is open to the public for scheduled visits. St. Roch was made primarily of thick Douglas-fir, with very hard Australian "ironbark" eucalyptus on the outside, and an interior hull reinforced with heavy beams to withstand ice pressure during her Arctic duties. St. Roch was designed by Tom Halliday and was based on Roald Amundsen's ship Maud. In 1940–1942 she became first vessel to complete a voyage through the Northwest Passage in a west to east direction, and in 1944 became first vessel to make a return trip through the Northwest Passage, through the more northerly route considered the true Northwest Passage, and was also the first to navigate the passage in a single season. Between 1944–1948 she again patrolled Arctic waters. On May 29, 1950, she became first vessel to circumnavigate North America, from Halifax, Nova Scotia, to Vancouver via the Panama Canal. In all she sailed 3 voyages. In 1954, the St. Roch was decommissioned in Halifax and returned to Vancouver. In 1958, she was placed in drydock at Kitsilano Point for restoration, partly inspiring the location of the planned Vancouver Maritime Museum, which opened the following year. In 1962, St. Roch was designated a National Historic Site of Canada. Although the ship was placed indoors in an A-frame building adjoining the museum, it remained formally under the control of Parks Canada. In 1995 Parks Canada handed over full control of the St. Roch to the museum. ^ "Historic Naval Ships Visitors Guide - RCMPV St. Roch". www.hnsa.org. Archived from the original on 2010-03-29. Retrieved 2009-08-29. ^ a b "Henry Larsen and the St. Roch". The Canadian Encyclopedia. Retrieved 2009-08-29. ^ James P. Delgado (2003). "Arctic workhorse: the RCMP schooner St. Roch". Torchwood Publishing. Retrieved 2012-03-12. ^ "Archaeology Reports-PWNHC". www.pwnhc.ca. Archived from the original on 2010-12-01. Retrieved 2009-08-29. ^ St. Roch. Canadian Register of Historic Places. Retrieved 30 January 2012. Wikimedia Commons has media related to St. Roch (ship, 1928). The Vancouver Maritime Museum is a Maritime museum devoted to presenting the maritime history of Vancouver, British Columbia, Canada, and the Canadian Arctic. Opened in 1959 as a Vancouver centennial project, it is located within Vanier Park just west of False Creek on the Vancouver waterfront. The museum is affiliated with CMA, CHIN, and Virtual Museum of Canada. Burrard Dry Dock Ltd. was a Canadian shipbuilding company headquartered in North Vancouver, British Columbia. Together with the neighbouring North Van Ship Repair yard and the Yarrows Ltd. yard in Esquimalt, which were eventually absorbed, Burrard built over 450 ships, including many warships built and refitted for the Royal Navy and Royal Canadian Navy in the First and Second World Wars. The schooner Bowdoin was designed by William H. Hand, Jr., and built in 1921, in East Boothbay, Maine, at the Hodgdon Brothers Shipyard now known as Hodgdon Yachts. 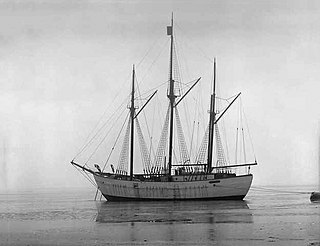 She is the only American schooner built specifically for Arctic exploration, and was designed under the direction of explorer Donald B. MacMillan. She has made 29 trips above the Arctic Circle in her life, three since she was acquired by the Maine Maritime Academy in 1988. She is currently owned by the Maine Maritime Academy, located in Castine, Maine, and is used for their sail training curriculum. She is named for Bowdoin College. Kajama is a three-masted former cargo schooner, that currently operates on Lake Ontario as a cruise ship. Aklavik was a small cargo vessel the Hudson's Bay Company used to carry supplies, and furs, to and from its outposts in the high Arctic. She was active in the first half of the 20th century.